The narrow peninsula of Southern Thailand stretches from the province of Ranong near the Burmese border all the way to Malaysia. 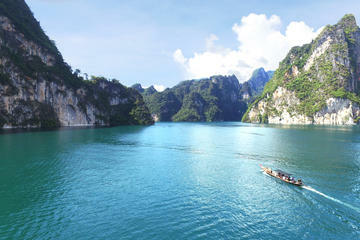 The region also covers a vast area in and around the Gulf of Thailand as well as the Andaman Sea. It is as unique in spectacular scenery as it is rich in multicultural heritage. Expect to see majestic forested mountains, rubber and coconut plantations and lush green jungle trails along much of the interior while mangrove forests, rocky outcrops, countless tropical islands, colourful coral reefs and the most beautiful soft white sandy beaches which extend along much of the hinterland. Some of the best diving sites can be found along the southern coastal shores of the Andaman islands while the popular beach resorts of Phuket, Krabi and Don Phi Phi draw the most tourists. Koh Samui is world famous for its beaches, Koh Pha Ngan is world famous for its parties and Koh Tao, all of which lie in the Gulf of Thailand, is the destination of choice for superb offshore diving. The deep south may have more in common with Malaysia than with the Thai heartland further north, but it may also be worth visiting simply to experience the region's unique culture, dialects and their delicious Indian, Malaysian and Chinese cuisine. Equally alluring is the spectacular mountainous scenery of the interior, the unspoilt beaches and islands on the west coast and the historic, cultural sites like those found at Nakon Si Thammarat, Phatthalung and Songkhla. Phuket is a magnificent tropical island resort in southern Thailand and one of the top beach resorts in the country with Patong and Karon beach possibly being the most popular. There is much to do and see on the island, some of which include numerous water sports, boat trips to nearby islands as well as amusement parks, zoos and aquariums which the whole family is sure to enjoy. There are also temples, Thai villages, shopping markets and a whole host of attractions to make your holiday here most enjoyable. And don't forget about the vibrant nightlife either. It's a crazy kaleidoscope of friendly folk, fabulous food and extraordinary lively entertainment. Days can be spent relaxing on the beach, leisurely shopping or visiting places of interest. Nights can be spent wandering around the streets, stopping for a bite to eat at local and international restaurants. Later on, you could pop over to one or other local pub or club and sip on your favourite cocktail or cold beer while listening to rock music and chatting with some new found friends. As an added bonus, should you be lucky enough to arrive during any number of the Phuket festivals, then why would you not want to join in with all these fun social activities. Starting in Bangkok and finishing in Phuket with this 5-day tour you'll get to explore the temples of Thailand, swim in the heavenly Khao Sok National Park and visit an Elephant rehabilitation sanctuary. You'll get to spend an afternoon exploring Wat Pho, Wat Arun and the Temple of the Golden Buddha before heading to Khao Sok National Park where you can relax on the shores of the Cheow Lan Lake and swim in the clear jungle Kho river. This 5-day guided tour includes 3 breakfasts, 2 lunches, and 1 dinner as well as all entrance fees as per the itinerary. See tour details above. Booking your tour here (at no extra cost) would not only give me a little extra pocket money, but you'd be helping me maintain this blog so that I can continue giving you more travel info on Thailand. The western shores of Southern Thailand incorporating the upper Andaman coast contain some of the most inviting beach scenery in the whole of Southeast Asia. The towering limestone stacks of Phang Nga Bay can easily be explored in a day and until recently boat tours of the bay took in all the best known sights such as the Ko Panyi Fishing Village where Muslim families live, work and play in homes built on stilts above the waterline in the shadow of a giant limestone mountain. A major attraction is James Bond Island made famous as the location where part of the 1974 James Bond movie "The Man with the Golden Gun" was filmed. Technically, it's not an island as it forms part of the mainland, but nevertheless, it's a popular day excursion from Phuket though there are no facilities to stay over. Towering Limestone outcrops are a symbol of Krabi and they stand proud like sentinels at each end of the river. Mangrove swamps can be toured by renting a long tail boat from the pier in the centre of town, as are daily excursions to a few islands such as Koh Lanta and Koh Phi Phi to the south and south-west respectfully and Koh Nang to the west and Koh Yao to the north-west. Another excursion from Phuket includes the Khao Lak Coast, comprising of long stretches of rocky and sandy beaches. Off the coast is Koh Similan with its massive boulders and underwater grottoes offering some of the best diving sites in the world. 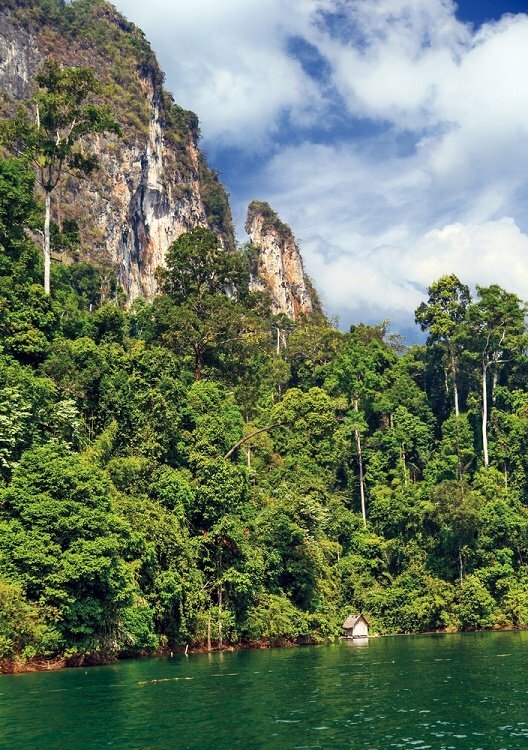 And nearby is the Khao Sok National Park forming the largest and most dramatic tract of virgin forest in Southern Thailand. Unofficially the first town you'd come across in the deep south is Nakhon Si Thammarat though it's seldom featured on any tourist itinerary. It is however the most historic town in this region and its lively center has several attractions worth visiting. From a historical standpoint Nakhon Si Thammarat was an important city of the Srivijaya Empire when it became a religious center bringing with it many Indian traders. Hindu shrines are a big feature here as are the shadow puppet plays and intricately etched nielloware. One of the few rice growing areas and the next big town as you travel further into the deep south is Phatthalung. Though the town earned its reputation and income from rice crops, it's now best known as the place where shadow puppetry was first performed in Thailand. So much so that the name Nang Talung is said to have been derived from the name of the town. 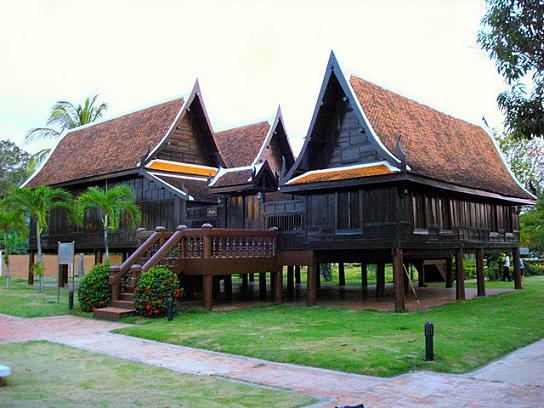 Phatthalung lies between two picturesque peaks and one of the largest wetland sanctuaries in the country. Further south is the town of Songkhla once known as Singora the Lion City. This town grew to prominence during the Srivijaya period. In the past it had a reputation for being a base for pirates, but now days, its traders are mainly a mixture of Muslim, Indian, Chinese and Khmer descendants. So much so that the cuisine, culture and language here reflex a multicultural heritage. Though the southern commercial and transport capital of Thailand known as Hat Yai won't win any major prizes for its beauty. And coupled with the fact that there are few cultural attractions here, most visitors tend to spend their daylight hours either shopping or dining at the reasonably priced restaurants. There is another side to Hat Yai but that normally begins after the sun goes down and it's mainly for men. The only real cultural attraction can be found at Wat Hat Yai Nai in the form of a reclining Buddha, said to be the third largest of its kind in the world. Other than that, there are some friendly markets and a few shark fin soup restaurants. Rubber, palm oil and fishing are the main economic ingredients of Trang as tourism has yet to cause a major impact here. However, the many islands in this region off the coast of the Andaman Sea have begun to show imminent signs of intense development, leaving little doubt as to what's coming. Trang has a strong Chinese characteristic with its equally excellent Chinese restaurants to boot. Attractions around here include cave exploring, beautiful beaches and cascading waterfalls while sporting activities include snorkelling and scuba diving. Koh Samui is the second largest island in southern Thailand and has become an international resort destination of choice. The island comprises of forested hills, coconut plantations, palm-fringed beaches and quiet coves. You'll also find a modern airport, abundant transportation, luxury hotels and resorts as well as a magnificent array of water sports. It is one of the best islands for a stayover. Koh Pha Ngan is just seven kilometres from Koh Samui though less developed for tourism due mainly to its bad road system. The island is, however, better known for its lively party atmosphere than for its tropical combination of powdery beaches, accessible coral reefs and rugged forested interior. 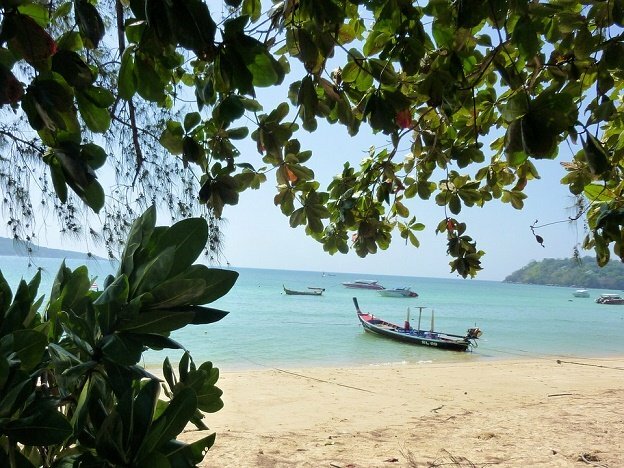 Koh Pha Ngan is a favourite haven for backpackers who flock to the island to revel in a bohemian lifestyle while staying in rattan huts or simply sleeping on the beaches and especially at Hat Rin Beach where the full moon parties are held. Koh Tao is located 40 kilometres (25 miles) from Koh Pha Ngan. It might be the smallest island in the Samui archipelago, but it sure is one of the prettiest. The main attraction here is the wide range of superb offshore diving sites where not only is there excellent visibility, but also a rich variety of marine life, making it one of the most rewarding diving spots in the whole country. The island itself is rather rugged with a densely forested interior, but the quiet coves and a fine sweep of sandy beach on the west side make it all the more worthwhile. Phi Phi Don is arguably one of the most sought after islands in southern Thailand with its crystal clear turquoise waters and dazzling white beaches. Spend your day swimming, snorkelling or just lazing on the beach. This has got to be one of the very best southern Thailand islands for quality time and absolute relaxation.